ASCA's School Counselor of the Year® program honors the best of the best – school counselors who are running a top-notch, comprehensive school counseling program at either the elementary, middle or high school level. 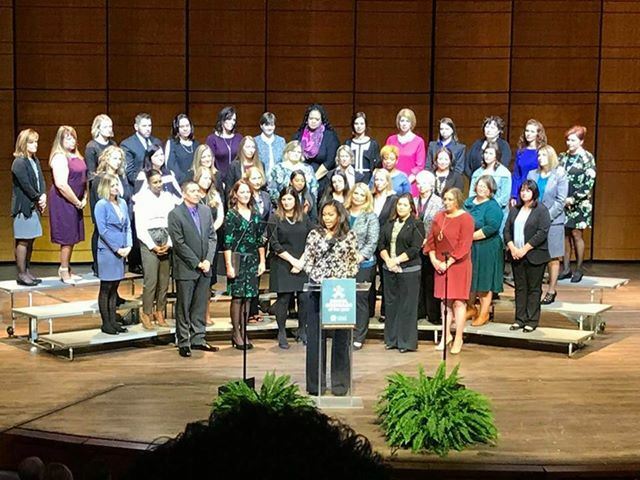 This program brings up to 10 finalists to Washington, D.C., in conjunction with National School Counseling Week each February, where they participate in a congressional briefing, meet with their members of Congress, tour Washington, D.C., and are honored at the School Counselor of the Year Gala. From these finalists, one school counselor of the year is selected. ASCA Annual School Counselor of the Year Gala. What is the ASCA School Counselor of the Year (SCOY) Award? The American School Counselor Association (ASCA) honors school counseling professionals through the annual School Counselor of the Year (SCOY) Award. Through this award process, ASCA honors the profession by recognizing that school counselors devote their careers to serving as advocates for the nation’s students, addressing their academic and social/emotional development as well as career and college readiness. ASCA chooses five School Counselor of the Year finalists from state SCOY winners (those nominated by their state counseling associations). The nominees are judged on many criteria including creative school counseling innovations, effective counseling programs, leadership skills, and contributions to student enhancement. The finalists are considered “the best of the best” – those running top-notch, comprehensive school counseling programs. From the five finalists, the ASCA School Counselor of the Year is chosen. All five honorees are flown to Washington, D.C., for three days of celebratory events including meetings with their members of Congress, a congressional briefing, a ceremony to honor them at the White House and a black tie gala.